Mumbai, April 19, 2017: The Board of Directors of IndusInd Bank Ltd. today approved and adopted its Audited Financial Results for the Year ended March 31, 2017. Net Interest Income (NII) for the quarter is Rs. 1,667.45 crores as against Rs. 1,268.21 crores in the corresponding quarter of the previous year, registering a robust growth of 31%. 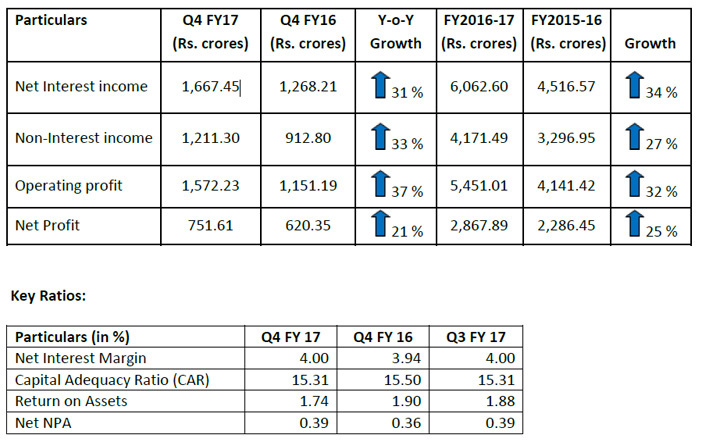 Operating Profit for the quarter is Rs. 1,572.23 crores as against Rs. 1,151.19 crores in the corresponding quarter of the previous year, showing a growth of 37%. Net Profit for the quarter is Rs. 751.61 crores as against Rs. 620.35 crores in the corresponding quarter of the previous year, showing a growth of 21%. Net Interest Margin (NIM) for the current quarter is 4.00% as against 3.94% in the corresponding quarter of the previous year. CASA (Current Accounts- Savings Accounts) Ratio improved to 36.85% against 35.19%. Total Advances as on March 31, 2017 is at Rs. 1,13,081 crores as compared to Rs. 88,419 crores on March 31, 2016, recording a growth of 28 %. Total Deposits as on March 31, 2017 is at Rs. 1,26,572 crores as compared to Rs. 93,000 crores on March 31,2016, up by 36%. Total Business at Rs. 2,39,653 crores. Net NPA as on March 31, 2017 is at 0.39% as against 0.36% on March 31, 2016. Increase in network to 1200 Branches and 2036 ATMs as on March 31, 2017 as against 1000 Branches and 1800 ATMs as on March 31, 2016. Bank has made one-off provision of Rs 122.00 crores against a large corporate account classified as ‘Standard Advance’ pursuant to specific RBI advice in this regard. The Bank’s exposure which is due for repayment in June 2017 relates to a bridge loan for a Merger & Acquisition transaction in cement industry. Net Interest Income (NII) for the Year ended March 31, 2017 is Rs. 6,062.60 crores as against Rs. 4,516.57 crores in the corresponding period of the previous year, registering a robust YOY growth of 34%. Non-Interest income is at Rs. 4,171.49 crores for the Year ended March 31, 2017 as against Rs. 3,296.95 crores in the corresponding period of the previous year, a growth of 27%. Core fee income is Rs. 3,488.59 crores for the Year ended March 31,2017 as against Rs. 2,809.59 crores in the corresponding period of the previous year, marking a growth of 24%. Operating Profit for the Year ended March 31, 2017 is Rs. 5,451.01 crores as against Rs. 4,141.42 crores in the corresponding period of the previous year, a growth of 32%. Net Profit for the Year ended March 31, 2017 is Rs. 2,867.89 crores as against Rs. 2,286.46 crores in the corresponding period of the previous year, showing a growth of 25 %. Net Interest Margin (NIM) for the Year ended March 31, 2017 is 3.99% as against 3.81% in the corresponding period of the previous year.